I’m about 40 feet underground, sitting in a subway car hurtling through the NYC subway system. On my lap is my ECBC Hercules backpack. In my bag was everything I’d need for a day trip: a water bottle, snacks, iPhone, sunglasses, a light jacket in case it would get cold and my laptop – just in case I’d need to get some work done. Each item was perfectly organized in the Hercules’s many pockets and compartments. The ECBC Hercules backpack is the quintessential daypack. 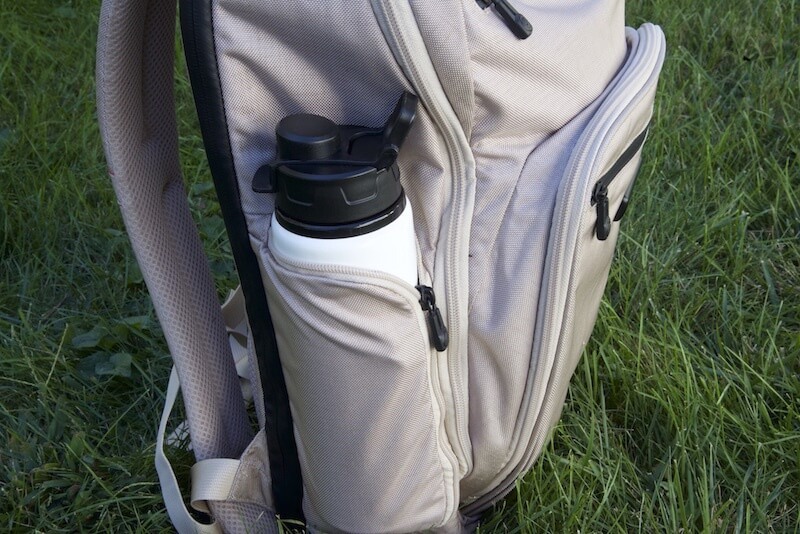 It comfortably holds everything needed, without getting in the way. It’s seamless and convenient. The Hercules backpack comes in 5 colors, black, green, blue, berry and linen (the color of the backpack which I am reviewing). 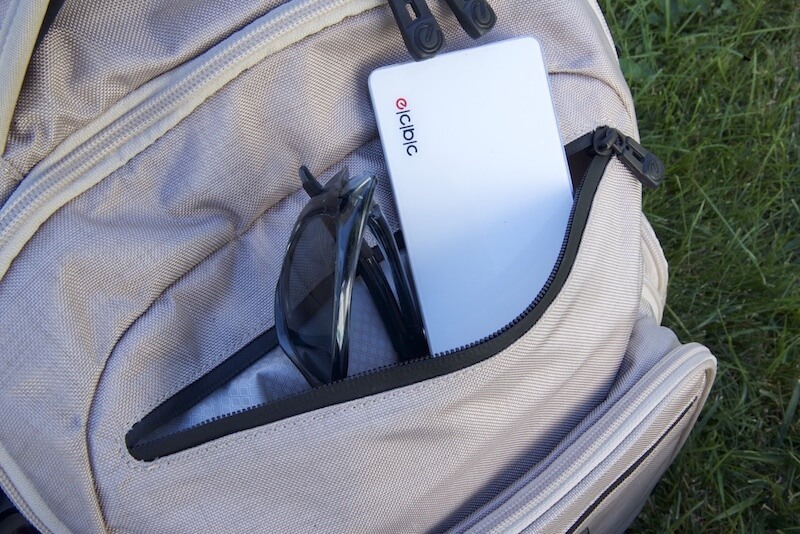 The Hercules backpack has a ton of pockets to keep all of your gadgets and other gear organized, but not too many pockets to make things confusing. One of my favorite things about the Hercules’ pocket system is the way it maximizes the usable space in the backpack. Panel loading backpacks such as the ECBC backpack tend to waste space on the top of large compartments because gear inside the bag shifts to the bottom, and in order to use that top space, you’ll have to have a fully loaded backpack. Travelers would have to stack items on top of each other in order to use that space towards the top of the backpack. When you fill up panel loading backpacks, they tend to expand out rather than up, like top loading backpacks do. This can make panel loading bags look bulky when fully loaded and waste space at the top of large compartments. 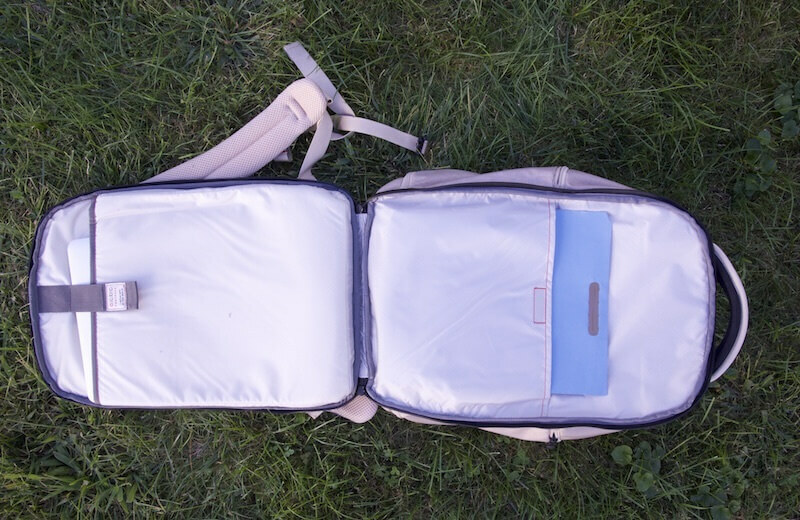 To combat this issue, the Hercules backpack has two pockets, one on the inside and one on the outside of the backpack located in the top front. This allows you to use that space without making the Hercules backpack look bulky. The pockets are also very easy to access and I like putting my headphones and sunglasses in these compartments. Another aspect which I really love about the Hercules backpack is how the zippers for the main compartment unzip all the way to the base of the backpack. 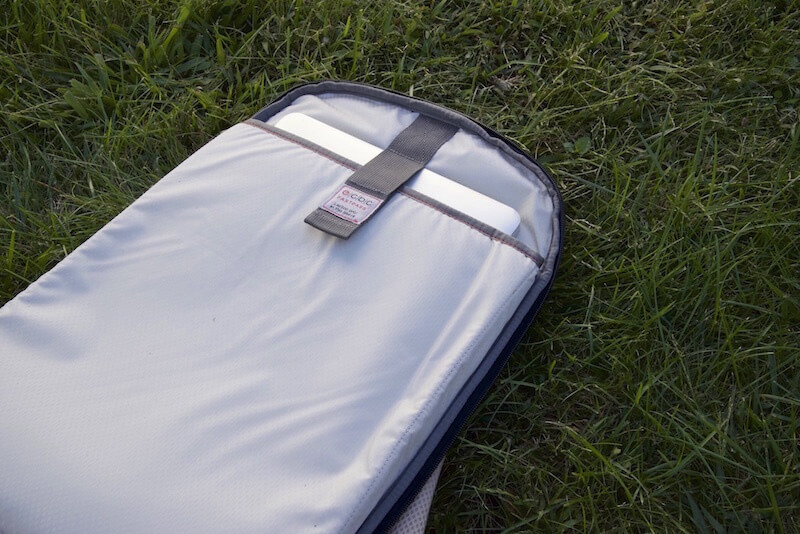 This makes it easier to load and unload the backpack, almost like opening a clamshell suitcase. You could potentially use the Hercules backpack for a light overnight trip since it has enough space for a few outfits. 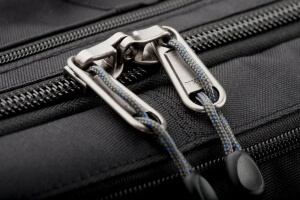 The Hercules’ ability to unzip all the way would help with reaching clothes at the very bottom of the backpack. The laptop compartment can be unzipped all the way, allowing you to lay your laptop flat while going through TSA checkpoints. This saves you from the hassle of having to remove your laptop every time you go through airport security. With all the pockets, I’ve turned my Hercules backpack into my mobile workstation, taking it with me whenever I need to do some work outside. 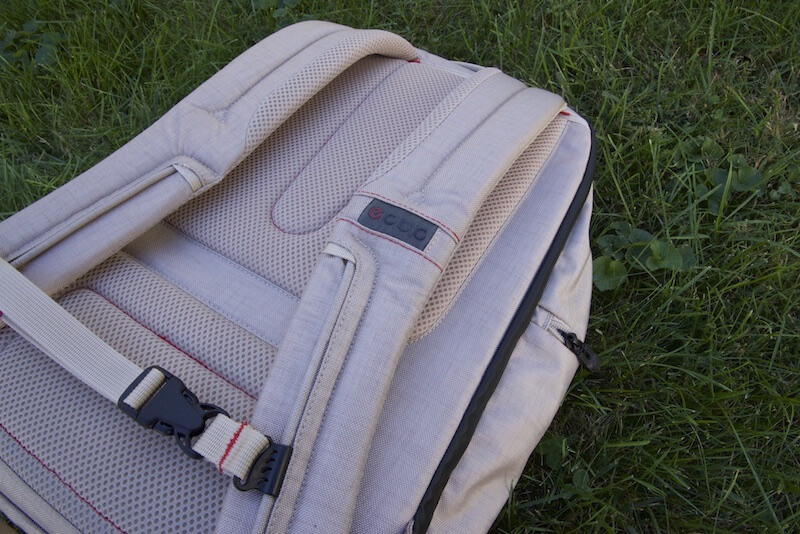 The straps on the ECBC Hercules backpack are well padded. I’ve carried the backpack with my MacBook Air, several books and notebooks, my Eco Vessel water bottle and more with the pack being comfortable. I’ve even used the backpack to carry groceries home. For extra stability, you can use the adjustable sternum strap. The ECBC Hercules backpack is a comfortable bag to carry as long as you don’t overpack it with heavy gear. The Hercules backpack does not have a hip belt and doesn’t really need one because it’s business oriented and not large enough to the point where a hip belt would be necessary. The back isn’t very breathable, but that isn’t an issue since this is a business/vacation focused backpack, not one for high intensity adventures. As a traveler, one thing which I always keep in mind is how to keep my belongings safe. 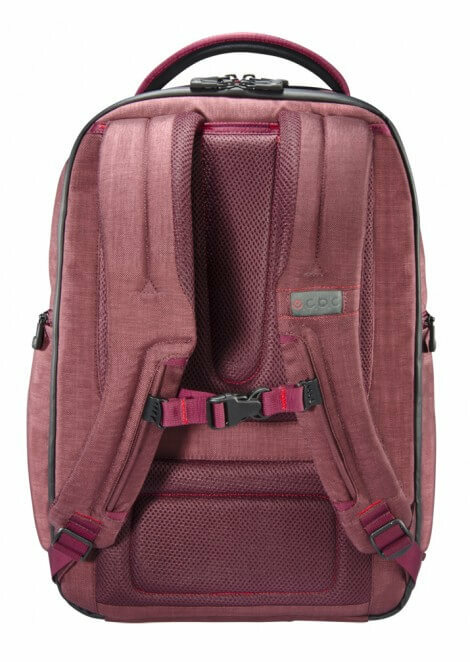 The laptop compartment close to the back of the backpack would be difficult for pickpockets to access, however the main front compartment could be easily opened without me knowing. It would be helpful if the zippers of the main compartments could be locked together. When receiving the Hercules backpack, I noticed that the color of the bag was slightly different from the color in the product photo found on EC-BC.com. 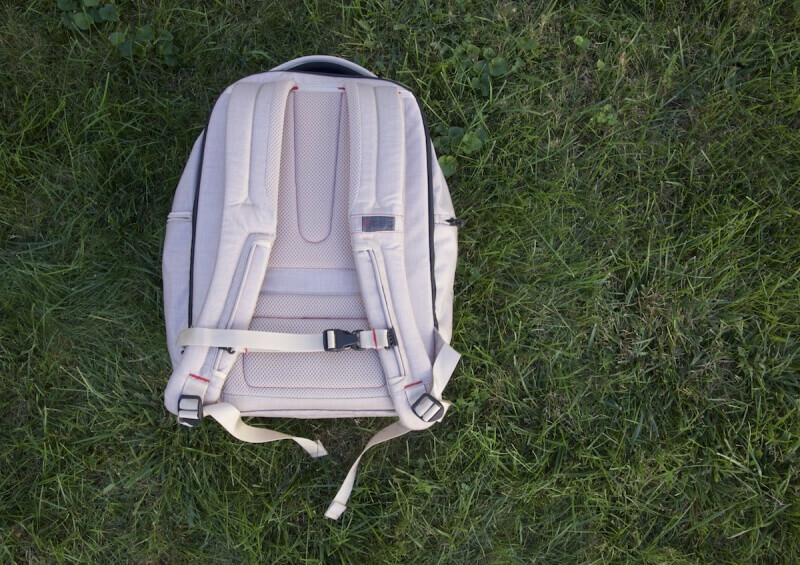 The ‘linen’ backpack in the photo looked to have a creamy white hue. In reality, the backpack had a darker tan/sandy color. This wasn’t a big issue for me, and I still really like the ‘linen’ color which isn’t as normal or boring like black. 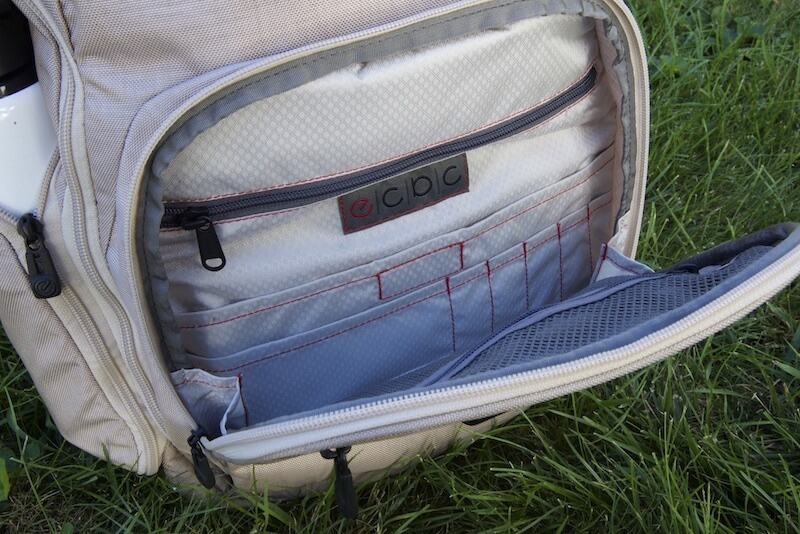 Overall, the ECBC Hercules backpack has almost everything a traveler would need. 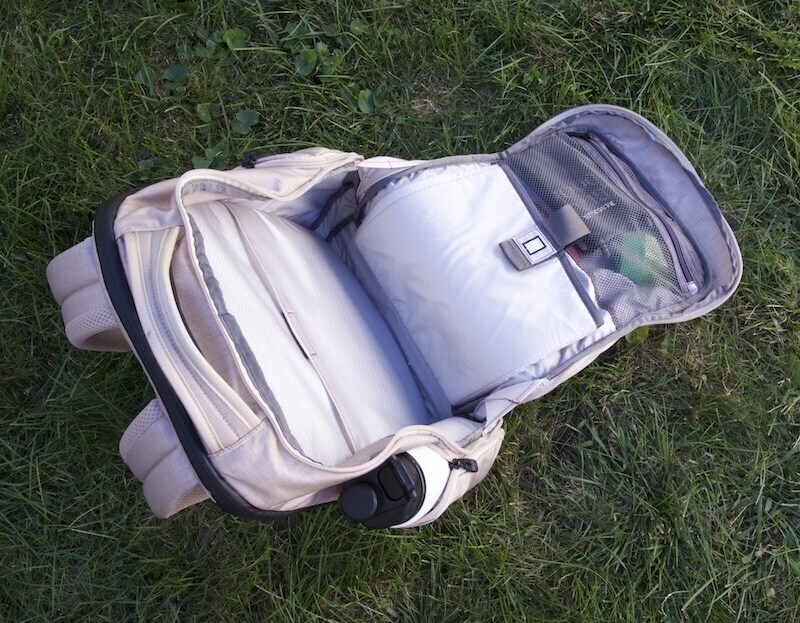 After extensively testing the bag, I’ve come to really appreciate how easy it is to access all the items in the backpack and how all the pockets were well thought out. This backpack is well suited for non-backpacking travelers, vacationers, business travelers, commuters and students. Priced at retail $139.99, the backpack is reasonably priced and something which I expect to use for a long time. Have any questions about the ECBC Hercules backpack? Leave your comment below. 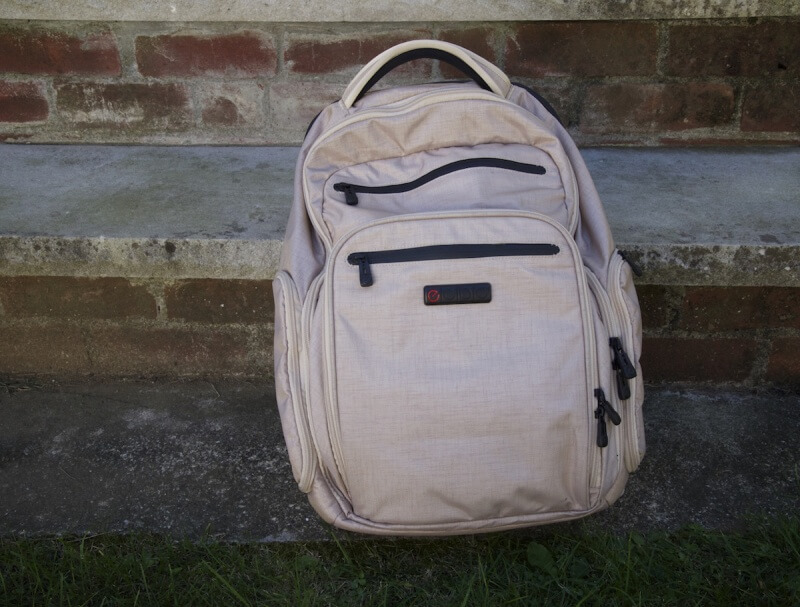 The ECBC Hercules backpack was provided for this review. As always, this ECBC Hercules review contains only my honest views and opinions. Some links found in this review are affiliate links, meaning that we get commission if you decide to make a purchase, at no additional cost to you. This helps to fund the site. 🙂 Find out more about me and this site here.